IPhone not having service is a very big problem that IPhone users face once in a while. Obviously, when your phone doesn't have service, you won’t be able to do a lot of basic or major things that you were meant to do on your device, things such as browsing with your phone, making phone calls, texting, doing some major and minor downloads and so on. Don’t feel sad, your IPhone having no service doesn’t mean it’s in a critical or bad condition. You are definitely not the only one experiencing such a problem and to every problem, there is always a solution.,, In this post, we have explained in detail the possible reason/causes of “IPhone having no service” and the best possible solutions that bring your service back. This way looks very simple but it’s a highly effective way of solving no service problem. Over the years, I have seen a lot of iPhone users solve their no service problem by just applying this approach. This involves turning on and off the airplane mode. Doing this makes your IPhone search automatically for the network over again. How to Toggle Airplane Mode? Locate and click settings, then click general and lastly tap Airplane mode. Click On and wait for 60 seconds before turning it off. If it is a minor problem your network will show up immediately after you have successfully toggle the Airplane mode. Restarting Your iPhone works like magic. This actually works on any device be it iPhone or Android its synonym to refreshing it i.e. refreshing or starting everything all over again. This looks cheap but Resetting Network has solved millions of No Service problems for IPhone users all over the world. This is highly recommended. You don’t know how to Reset Network? No worries the step to follow is below. Warning: Make sure you back up your Phone to iTunes or ICloud, in other not to lose your files/data. Restoring your IPhone without Backup will make you lose important files or data. Please and please Backup first. To be sincere restoring your IPhone device yourself is a bit risky, but if you are ready and willing to take the risk it really worth’s it because it can solve the issue but the problem is no 100% guaranty of it being a success. TechPhoneReviews won't advise you to Restore your IPhone device if you don’t have an Apple store or Authorized Apple repairer nearby. Follow the Restore steps stated below gently. · After the previous step has been completed, you will be able to setup your device as a new phone. It is always advisable to regularly update your IOS because new IOS normally comes with fixes to known and unknown bugs. Below is how to update IOS step, if you don’t know how to already. Your IPhone not having service may be due to your phone being faulty or your sim being bad. The best way to clear the air in this type of situation is trying another sim on your IPhone and trying your own sim on another phone. With this If the other sim eventually works and your sim works or both didn’t work, you will easily know whether your IPhone is faulty or your sim is bad. From here you will know the best option to take easily. Yeah, the best thing you should do after trying all the above tricks without getting any positive result should probably be contacting your carrier customer care. Carrier normally blocks/ban their customers when they violate their rule intentionally or mistakenly. Once they notice any fraudulent activity they normally take such action ASAP. · Check how good the network coverage in your area is. The solution Provided above works effectively on IPhone 4, IPhone 4s, IPhone 5, IPhone 5s, iPhone 6 Plus, iPhone 6s, iPhone 6s Plus, iPhone SE, iPhone 7, iPhone 7 Plus, iPad, iPad Mini, iPad Air and iPad Pro. 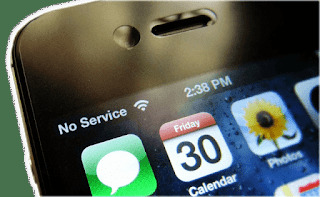 Were you able to solve no service issue on your IPhone, after using the above-provided solutions? Feel free to ask any question and drop suggestion using the comment box provided below.